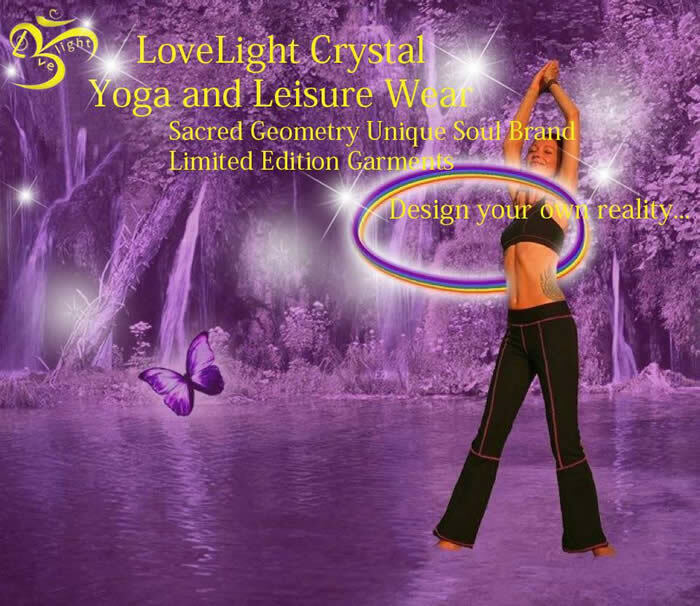 LoveLight garments are unique, made with LOVE & highest quality Integrating Sacred Geometry with Pure crushed Crystal infused into Sacred Geomertry Symbles and wording on all our designs. High Vibrational wear for you. The collection you are looking at is called “Dress your Soul”. LoveLight garments are unique, made with LOVE & highest quality materials Integrating Sacred Geometry with Crystal in all our designs. Our Intention.. LOVELIGHT’s intention is to raise human awareness, to help us grow, to assist us on a path of a radical transformation that we are all experiencing right now. LOVELIGHT resonates with our planetary changes at these special times. You cannot help but feel the energetic difference that every LOVELIGHT garment carries. We are entering a new World. LoveLight is a unique brand of garments that are amazingly soft silky and comfortable to wear. Apart from the high quality fabrics, sophisticated Yantra prints, We have integrated our Sacred Geometry with Clear Quartz Crystal & Black Tourmaline Crystal in all our garments. Birthing a High Vibrational garment for your body to Breathe into. About Our Sacred Geometry Sacred Geometry is a pure language that cares not for the country of your birth, the color of your skin or your cultural beliefs. It expresses the interrelating harmony that lies at the heart of creation, transmitting patterns of frequency which resonate with our original Human blueprint. Being in a sacred geometry field has a powerful effect on the human hologram, for all of us. It speaks to our matter, to our DNA, it creates a space for us to change, to awaken to our cosmic truth, to grow and to expand. That is the reason LOVELIGHT wear is connected to sacred geometry. Its intention is to take part in changing the world, awakening humanity to its original divine nature. About Our Printing All the garments are pieces of art because they involve a very rare method called Chas printing. Chas is a highly skilled rare technique that requires each garment to be personally worked on by a Chas print artist and then hand finished and checked. I also needed to incorporate the very sophisticated sacred geometric symbols around this printing technique. A huge amount of awareness, knowledge and patience is needed to achieve the end product that you will be wearing. No mass produced garment maker would or could ever use these highly skilled time consuming methods. About Our Crystal Within the Chas print we add Pure Crystal directly into to the ink before the printing process so each garment has Crystal infused directly into all our Sacred Geometry and wording…. The Crystal we use is of the highest quality and has been programmed to the frequency of unconditional Love. Clear Quartz Crystal has a electromagnet field that vibrates…sometimes 30,000 times per second! and will amplify energy and thought as well as the properties of other crystals, continuing to broadcast that energy throughout the world and into the etheric realms. It absorbs, stores, releases and regulates energy.. Clear Quartz draws off disharmonious energy of all kinds, creating a space of sacredness. It balances and revitalises the physical, mental, emotional and spiritual planes. Cleanses and enhances the organs and subtle bodies and acts as a deep soul cleanser, connecting the physical dimension with the mind. Stimulates the immune system and brings the body into balance. Clear Crystal Quartz, harmonises all the chakras and aligns the subtle bodies. We use the highest quality fabrics, two kinds of silky rayon (wood); thin for the tops and a thicker version for the pants. High quality cottons, silk elements and embroidery are also added to the process of the LOVELIGHT creations include eco friendly bamboo and organic cotton. The material of our Fifth Element Pants and Flower of Life pants will hold your body like a glove and last for years wash after wash…. We are entering a new World. Lovelight is a product of a new consciousness! Its intention is to assist humanity on its path of growth and expansion. LoveLight is a unique brand of garments that are amazingly soft silky and comfortable to wear. Apart from the high quality fabrics, sophisticated Yantra prints, We have integrated our Sacred Geometry with Clear Quartz Crystal & Black Tourmaline Crystal in all our garments. Birthing a High Vibrational garment for your body. LoveLight is here to remind you - we are all Divine, Luminous Unlimited Beings. A heart race that got trapped in a Mind, but on its way home now. Sacred geometry is a language of Light. We speak that language. LoveLight went through a serious process of finding the right people, fabrics, prints, designers, sacred geometry experts. Our sacred geometry and all wording is Crystal infused to amplify the ancient wisdom of the Symbols.. LoveLight was born out of great intentions, out of love, out of Consciousness. This Unique Yoga and clothing Brand is yours now. When you wear it, Enjoy it, and shine the light without and within.